This edited volume is the first to discuss the methodological implications of the ‘emotional turn’ in International Relations. While emotions have become of increasing interest to IR theory, methodological challenges have yet to receive proper attention. Acknowledging the plurality of ontological positions, concepts and theories about the role of emotions in world politics, this volume presents and discusses various ways to research emotions empirically. 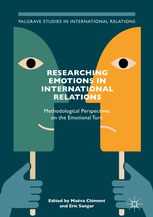 Based on concrete research projects, the chapters demonstrate how social-scientific and humanities oriented methodological approaches can be successfully adapted to the study of emotions in IR. The volume covers a diverse set of both well-established and innovative methods, including discourse analysis, ethnography, narrative, and visual analysis. Through a hands-on approach, each chapter sheds light on practical challenges and opportunities, as well as lessons learnt for future research. The volume is an invaluable resource for advanced graduate and postgraduate students as well as scholars interested in developing their own empirical research on the role of emotions.